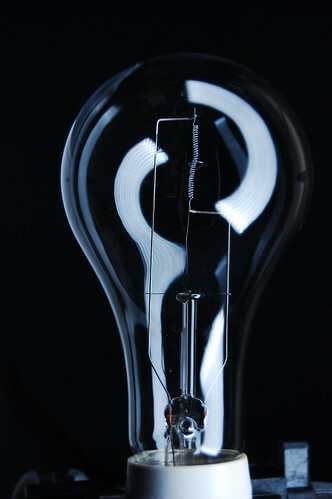 I need a newer bulb that isn’t so scratched up on the outside. Database quiz today (online), database quiz tomorrow (in class). 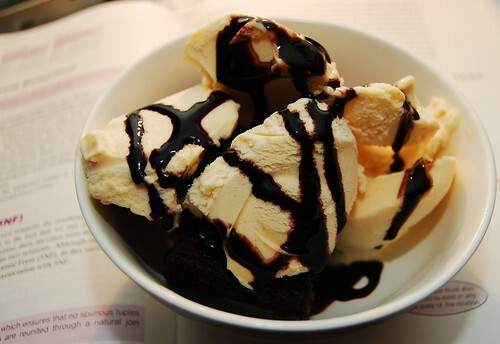 But for now… ice cream! I was hoping to have a bit more free time now that I’m on my spring semester, but it doesn’t seem to be the case. I’m currently taking a Unix class and a Database class, and the database class is consuming all of my free time. Its a hybrid class, which means its part in-class, part online. Somehow this translates for my teacher as 6 nights of homework in a row, starting tomorrow (so that includes homework due every night of Memorial Day break). Figure out what’s wrong with my Xbox (It can’t see the mod chip, but my spare modded xbox reduces motivation). Figure out what’s wrong with my Carputer’s LCD display. The screen goes to standby half the time, I’m hoping its a software problem (hibernation bug maybe?). Run cat5e (correctly, not through the air return) from the basement to upstairs. Terminate previously mentioned cat5e at a patch panel on one end, and at some wall jacks on the other. Clean, then try to fix an OLD oscilloscope that I got from a friend. 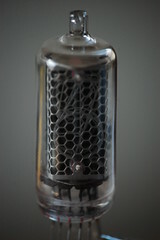 Continue my nixie clock pipe dream/vaporware. Convince myself to spend money on a HTPC to replace my Xbox setup. I’ve probably missed something in the list, but oh well. I bought a ethernet shield and have rigged a rtc chip up to it as well. My plan is to pull information from a NTP server (the basic code for this is working) and set the timezone offset via a web service (that uses the WAN IP). The user will then be able to tweak all the settings via a web interface. I’m thinking about just having one button on the clock itself for snooze/dimming/misc functions. Just a reminder to register to vote! Its even easier thanks to google! It even can direct you to links that will tell you if you’ve previously registered (if you want to check). Sorry I haven’t updated as frequently as I would have liked, its been pretty crazy between family, work, and school. Some of you probably know why the last few weeks have been a bit crazier than usual :( , but I’m not going it get into that sort of thing on a blog. When that’s all sorted out, I would like to do a fresh install on my main computer, as it acts a little wonky from time to time. Even further (much further) down the road, a reinstall of windows on my laptop would be nice, as would getting a backup server up and running utilizing some old ide drives, and my 1tb sata drives, configured using LVM or the likes. As far as nixie goes, I’ve spent some time on the code, and spent a bit more time messing around with Eagle PCB design software, its pretty slick. I’m not nearly as far as I would like to be, but hopefully I’ll have some more time later in the week. 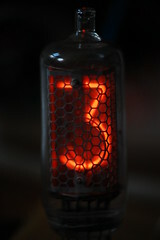 My nixie tubes came in yesterday, and I finally had a chance to take a few pictures of them. I’m still trying to decided upon the best method for driving them, though. know that either way, I’m going with a direct drive method. My initial plan was to use shift registers and old nixie drivers, but the inability to have more than one pin selected at a time really limits my wiring options. I’m currently thinking about designing a circuit board for mounting the tubes, along with some surface mount transistors, and just driving the digits via a larger number of shift registers. The problem with this design, is it doesn’t allow much in terms of prototyping (and I would have to learn how to use a pcb editor, such as eagle). I probably won’t have too much time to mess with them, as the end of the semester is on its way, but we shall see. STANDARD DISCLAIMER: I take no responsibility for your actions in regards to this information. Always take safety precautions when handling any explosive/dangerous materials. This is a project that I finished for last years Fourth of July. It was actually intended for the year prior to that, but rushing to finish led to a dead controller board, so I had to postpone its use a year. 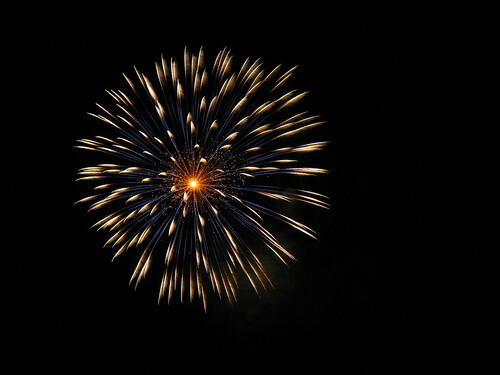 Despite some incidents involving the fireworks themselves, the controller worked great. Sadly I don’t have anything in terms of in progress photos, but hopefully you’ll be able to make sense of it. This box has 3 modes: off, on, and fire. 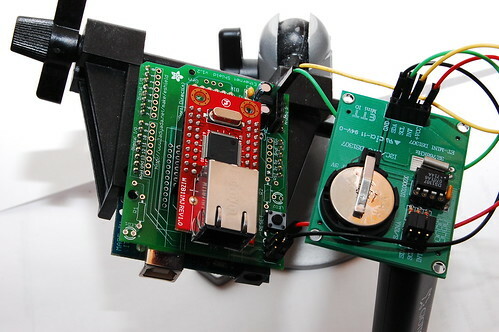 Power is supplied to the relay board (the microcontroller, but not the individual relays) by turning the key to on. Flipping the toggle to test mode allows me to check the connections on the electronic igniters. This is done by making a circuit through each led and terminal block with a high resistance resistor. 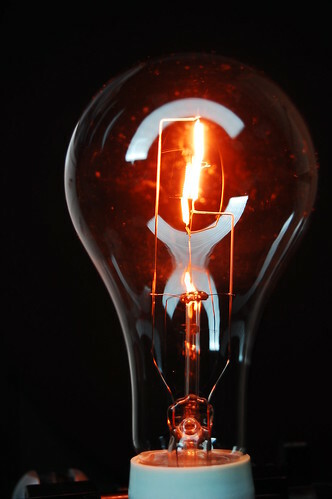 There is enough amperage to light the led, but not heat up the nichrome wire. When the toggle is flipped to on, power is removed from the test circuit, and the 12v wire going to the relays on the relay board is energized. The entire system is then controlled by a remote box, which is a modified version of the original remote that comes with the kit. You can you the original remote as is, but (due to the lack of an on off switch and key) it is highly discouraged. 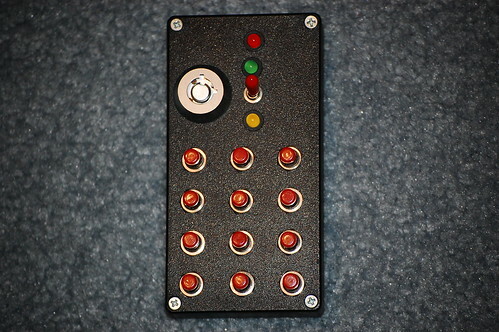 The first step is obtaining the remote control relay board. I picked mine up on ebay, although their selection seems to have changed slightly since I purchased mine. (edit: I guess people have been having luck ordering the transmitters here and the receivers here) Despite this, the idea is the same, and as long as you know how a relay works, you’ll be fine. In order to save myself time, as well as make the board a bit more reliable, I decided to wire up all of the relays so that one side of the relay was connected to 12v, when the board was in the fire position. I also beefed up the wiring going between the terminal and the relay. I considered mounting this board onto the box, but I decided to let is simply float around inside. 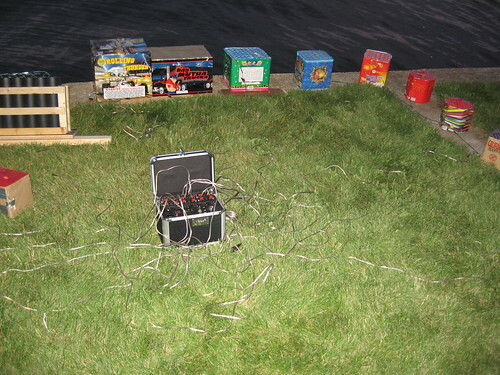 This allowed for some isolation from the shock that the fireworks could produce (there are some reports of relays being triggered by such repercussions). To electrically isolate the board, I used some zip ties in each hole (to provide spacing), a piece of plexiglass (ok, part of a cd cover) and some hot glue. This all can be seen in the photo below. The remote wiring is simply removing the old buttons, figuring out the circuit a bit, and then wiring up new switches in their place. 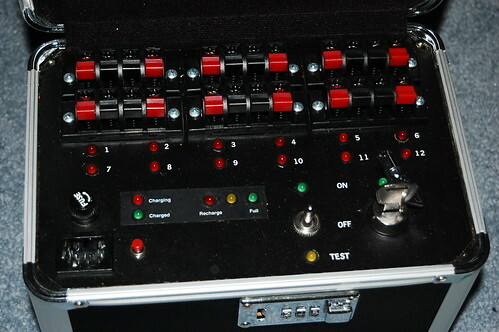 LEDs were added for power and transmit indication, and two switches (key and toggle, just as on the main box) were added for power control. I’m not going to go into any detail here, as you can get away with the original remote, just make sure to keep the battery out until you are ready to fire. I took the easy route with the charging circuit, and ripped one out of an old car jump starter that had a dead battery. This just required the relocation of the status button, as well as the leds. I’m not sure if it was needed, but I relocated the voltage regulator with a piece of scrap heatsink, as it ran very hot. I was feeling unimaginative with indicator layout, so I just used the sticker from the original indicators. The battery is just a standard 7ah 12 volt sealed lead battery, very similar to the dead one it replaced. This can be best seen in the shot below, as the board that is placed perpendicular to the main panel. Note: you can always take the even easier route, and just use an external charging circuit. To help explain to some extent this circuit: The blue wires coming off that board go to a transformer, which was originally on a much shorter wire. Following the transformer, you can see the yellow wires, which lead into my hotglue mess (I wanted to make sure those lines were well insulated and secure) of a power socket. This is a standard psu connector that I ripped from an (you guessed it) old power supply. The 12v (ish) off the charger then heads to the fuse, where one wire heads towards the battery for charging, and the other goes to the main key switch seen with the red electrical tape. That key switch energizes 3 things: The relay board microcontroller, the power led seen above it, and then the toggle switch next to it (green wire). 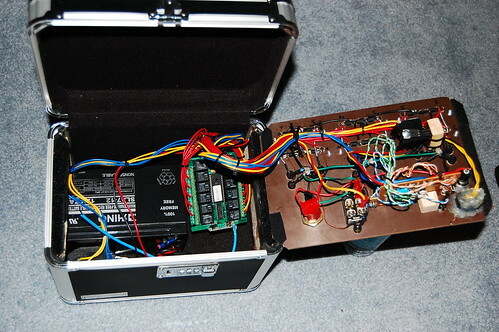 When the switch is in the down position, power flows out the green wire, and to the clusters of resistors for the leds, which test for continuity in each channel (by connecting to the positive terminal). When in the up position, power flows to the yellow wire, and thus the relays on the board are energized and waiting for a signal. 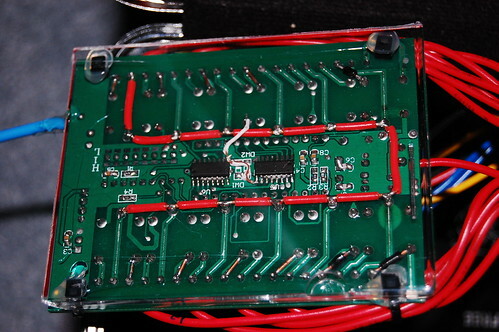 The giant cluster of red wires you see coming of the relay board, simply go to the positive block on each terminal. The ground rail is much simpler: all non test leds, the negative side of battery, the negative terminal on the relay board, all connect to black negative wire that goes around the 12 negative terminals. The igniters are almost whole project in themselves. 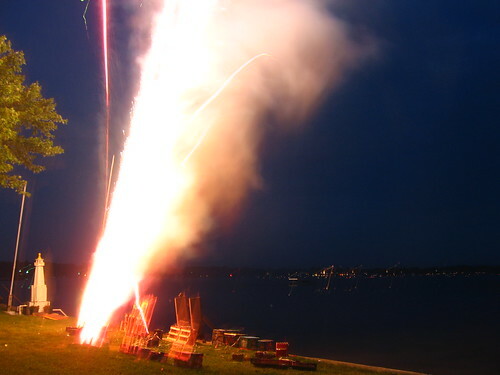 Although you can also take the non DIY approach: buy some model rocket ignters, get a fireworks certification to buy commercial firework igniters. Neither option was that cheap, so I decided to make my own. The problem with most black powder is that it is too course for our application. To make it smaller, simply fill maybe a 3rd of the mill with black powder, and then about the same amount with lead media (again, didn’t have a mill, so I just used lead fishing lures). Be sure to use only lead media, you do not want any sparks forming. To be extra safe, make sure to only run the mill outdoors, with some distance put between you and the mill with an extension cord before you plug it in. I just let this run overnight, and was presented with a fine powder in the morning. While the mill is doing its thing, you can get your Nitrocellulose mixture going. Take some scissors, cut up 4 or so balls into smallish pieces (the smaller you cut, the less time it takes to dissolve). This is then placed into a glass container with some Acetone. It will take time for the plastic to dissolve, so its best to just stir it every few hours until it has the consistency of elmer’s glue (it will look like it too, but don’t be fooled, it is very flammable in its current form). Once this is done, and your black powder is ready, you can start adding the powder to your acetone mix. This will have quite a thicker consistency, but you don’t want to add too much, otherwise the BP will crumble off the tip of your igniters. If you’ve made it this far congratulations, and now for the most tedious part: wiring the igniters. Essentially you get to strip wire 48 times (12 ch x 2 wires per channel x 2 ends to each wire). Next, you wrap the nichrome wire around one end, bend it downward, and then wrap the other wire. Finally, you dip it into the mixture made earlier. 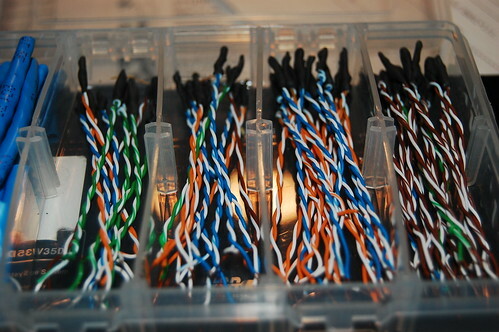 To connect between the terminals and the igniters, I used lengths of speaker wire with alligator clips attached to the ends (as shown below). The igniters are simply taped to the ends of the fuse. Some use electrical tape for this, but I prefer aluminum tape that is normally used for ducts. I would just like to thanks the folks at the pyrouniverse.com forums, this wouldn’t have been possible without them. Slightly more info can be found if you go to the image on flickr. I just got this before heading off to Florida for spring break. 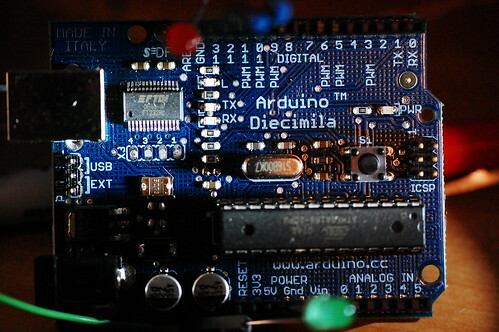 For those that don’t know what an arduino is, and are intrigued by the photo, click here to go to the project’s homepage. 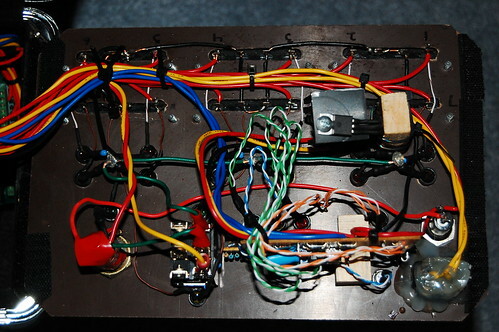 Ultimately, I hope to make a Nixie clock using this as the starting point. I have a bunch of stuff from futurlec ordered to mess around with, but I went with the cheapest shipping, and it still hasn’t shipped yet after a week. I’ll try to get some photos of the trip up when I get a chance.